Two primary factors influence successful spawning years. The first is environmental conditions like weather and water quality, and the second is the presence of spawning adult (bull) redfish. Federal regulations forced Atlantic Coast states to implement very conservative management practices in the 1990s and on into the 21st century. This has resulted in not only lots of big fish, but also lots of little fish that are getting bigger and bigger. We’re looking at a fishery on the rebound, something that’s pretty unusual in this day and age. But before we start patting ourselves on the back for the good job we’re doing, let’s remember that the fishery still hasn’t totally recovered and there is still a need for conservation. Currently in Maryland you can only keep one redfish. Most anglers prefer to release them so fishing will continue to improve. Good catch and release practices are essential. Red drum are a little tougher than striped bass, but a lot of fish will still die if they aren’t handled and released well. Nets split their fins. You don’t need them. Since they’re slippery and have small teeth, it’s tempting to put a hand in their gills. That’s a good way to kill a fish. Your best bet is to reach down and grab smaller reds by the lip. C’mon now, a slot red won’t bite you too bad. If you really don’t want to lip your fish, use a Boga Grip or similar holding device. Lipping a red and keeping your hands off their body helps prevent loss of slime, but don’t ever hold a heavy bull drum up by the lip or pull it over the rail with a Boga Grip. Instead, reach down and put a wet hand under the belly to support its weight. 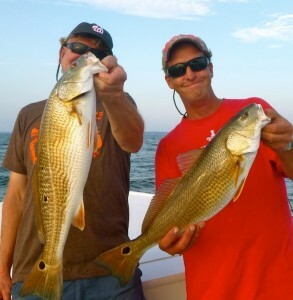 Also, redfish “stun” more easily than stripers. In other words, they go into shock and won’t always swim away when they’re released unless you revive them first. Just move them forward in the water until you feel them get strong enough to swim on their own. With good catch and release techniques we can help insure a dynamic red drum fishery in the Chesapeake Bay. Okay, now what about the hows and wheres to catch redfish? Reds have been showing in good numbers in the Tangier Sound area all summer, but they’re just now getting prolific in the Mid-Bay. While the usual technique of casting scented paddle-tail or twister-tail soft plastics or Gulps around rocks or deeper grassy shorelines works well, you should also keep an eye out for fish relating to structure in deeper water. Look for submerged rock piles and thick oyster beds. It’s tough to target big bull reds in the Mid-Bay even though they are in the area to spawn in July and August, but it’s possible to happen across a real trophy if you’re in the right place at the right time. Fishermen are catching bulls near the Bridge Tunnel now using bait. 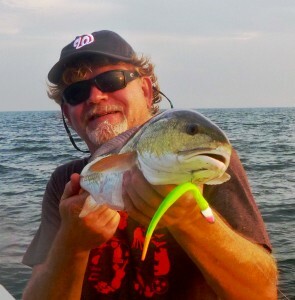 I discovered by accident this week that redfish are hanging out on some of my favorite summer striper humps and ledges and they’ll readily take my usual artificial rockfish lures. Lately, my best fishing has been on oyster bar ledges that drop from 15- or 16-feet down to 24- or 25-feet deep where there is a lot of bait. If there is additional cover like rocks or grass, that’s a plus. Redfish relate to moving current just like other species in the Chesapeake. They also like clean water. 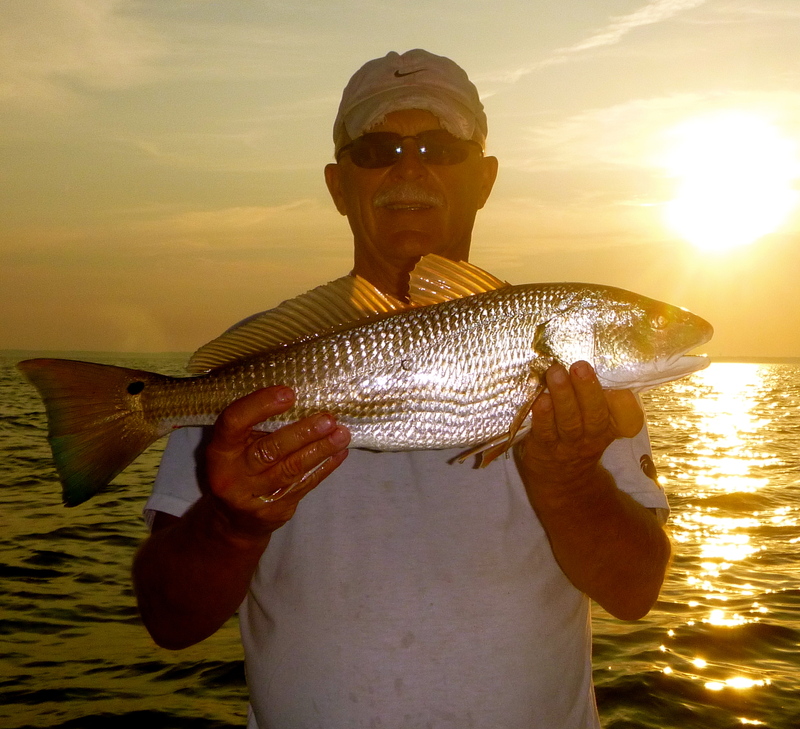 All those spots where we usually catch stripers in August and September are now holding reds too. Just set up on the ledges and bang the bottom with a 6″ BKD or 5″ Gulp and see what happens. I caught fish all weekend, but here’s my report from this past Sunday. I got a call from my friend Brian to say he and another buddy Phil were trailering their boat to the Bay. I hadn’t planned to fish but my wife said I was bugging her so I called Brian back and suggested they leave Phil’s Grady at home and join me on Thunder Road. 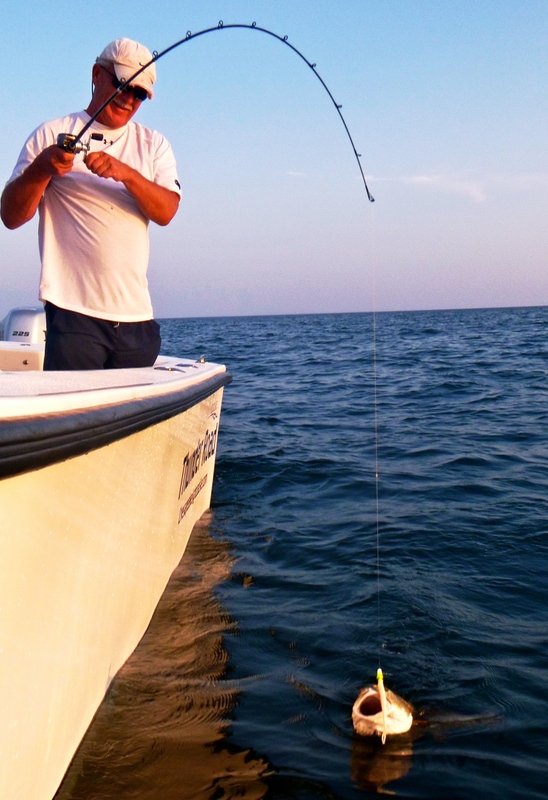 We launched off Kent Island about 4:30 and found some breaking rockfish and bluefish pretty quickly. I was hoping to see some Spanish in the mix, but it wasn’t happening. I decided to check out some humps near the channel. These spots are all-or-nothing kinds of locations that drop from 16-feet down to 25-feet. If I find fish there, they’re often quality stripers. There were no birds or breaking fish anywhere close, and not another boat in sight. Watching my sonar as I cruised across my spot, I was disappointed when I saw no rockfish marks. I marked a few bait balls though, so I decided to shut down the engine and try a drift anyway. Almost immediately, Phil hooked up and his fish started peeling drag. “That’s not a rockfish,” he said. I didn’t believe him. I thought he had a big striper because, as he was fighting his fish, I hooked up a nice striper. Phil’s fish came unpinned, but when he reeled in his lure, it had a circle hook attached. The circle was hooked neatly through the loop knot on the 1-ounce jig head of his BKD. Wow, that was one lucky fish! Phil swore it was a red but I still didn’t believe him. We laughed about him doing the fish a favor by removing stray hooks when, thwack, he hooked up again. 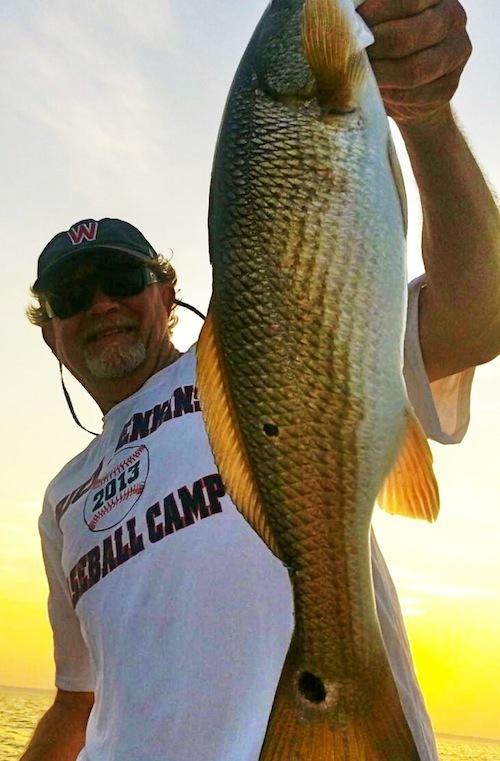 This time he got the fish near the boat and I couldn’t deny it any more – it was a 25-inch red drum. As Phil landed his fish, I felt a tap on my Powell rod, and then Brian set his hook too. Wow! 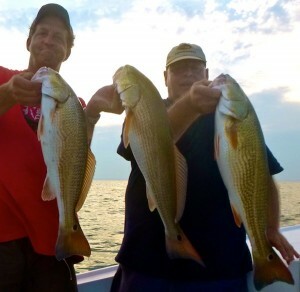 A triple hook up, with all three of us landing quality redfish. “Okay, I admit it, now we’re on to something!” We all hooked up again on the next drift and we repeated similar success from 6:00 until dark. We also caught several nice rockfish and blues. I’m not exaggerating when I say this was the best redfish bite I’ve ever seen on the Chesapeake. With the exception of the bigger fish that Phil rescued from the circle hook, all our fish were slot-sized. The pictures here are of fish that came over the rail at the same time, not of fish we kept. 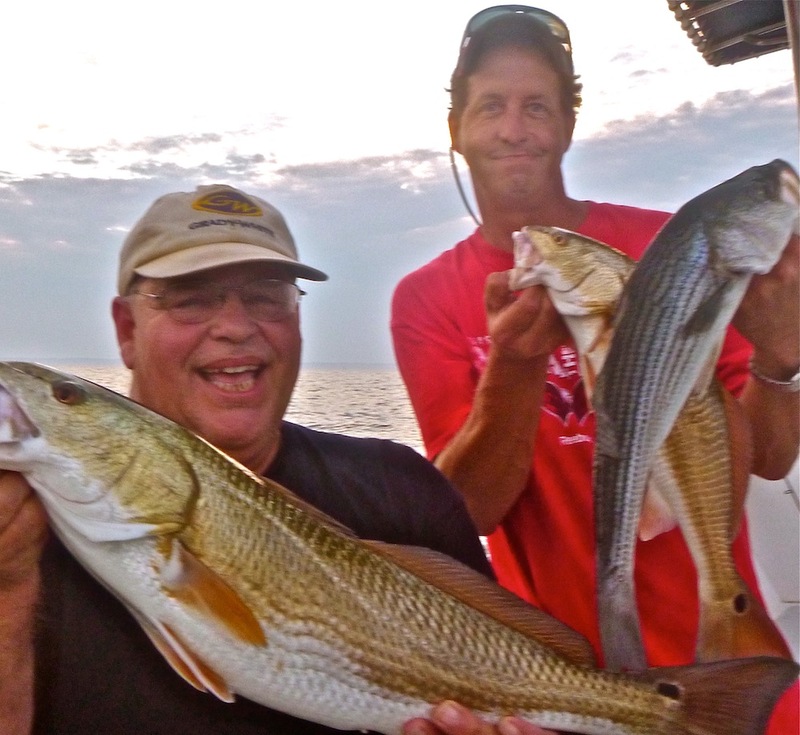 It’s great to see good red fishing in the Chesapeake. Frankly, if these fish get a good hold and I can keep catching them in open water miles from nowhere, I’ll forget about stripers. Wait, did I say that already? Go get ’em! Shawn, that’s exciting to see these redfish in bay for the last two years. I mostly fish the upper bay. Have you caught reds above the bridge? Your reports, book and presentations are great. This is one of the coolest reports I’ve ever seen. Nice redfish close to home is as good as it gets. And sounds like you’re still on them. Rock on! Good report. These are pretty fish. People around here probably won’t do it but thank you for the release tips. This is a great report and great info. BTW – are the humps you refer to by any chance located on the eastern side of the channel between the Bay Bridge and Bloody Point??? Thanks for the site and all the info you share. One question,Shawn will reds hit on Top?I suspect they would in the right conditions? Thanks for the info on RF,catching them on LT with lures.I’m looking forward to hopefully catching my first. Yes they can, Roger. I got a 33-inch red earlier this year on topwater. There was a 44-inch bull caught in the mid-bay last week on topwater. However, I am not currently targeting them that way. I caught some last night jigging while the rest of my crew worked topwater for stripers. also shawn do you think the redfish care about jighead color, spike it die etc… or is that just with rockfish?